Ciro Immobile, the well-travelled Italy international will not be setting the world alight at the 2018 World Cup. Due to the current way in which teams qualify for the tournament, Italy didn’t qualify whereas other weaker teams such as Panama are seemingly there just to make up the numbers. Immobile scored an astounding 29 goals in 33 league games for Lazio this season, making him one of the best strikers in the world right now. Another player not making the tournament is Gareth Bale. Bale scored potentially the best goal in UEFA Champions League Final history with an overhead kick to break Liverpool hearts and because Wales weren’t able to qualify for the tournament he’s got to sit at home to watch. Immobile and Bale aren’t alone, they are part of a super strong starting 11 of players who aren’t at the tournament and you have to think with this plethora of stars not making the cut, France odds to win world cup have shot up. To see the strongest starting 11 of players whose teams didn’t make the tournament have a look at the infographic we have put together below. Neymar scored twice, made two assists and won a penalty as PSG came from behind to beat Toulouse 6-2. Neymar was outstanding in his first game at the Parc des Princes as Paris Saint-Germain came from behind to beat Toulouse 6-2 in Ligue 1, the hosts scored four times in the last 15 minutes following a red card for Verratti. Neymar – clearly emotional prior to kick-off as a minute’s silence was held for the 14 people who were killed in the two terror attacks in Catalonia this week – was heavily involved in the early exchanges, but PSG were behind when the unmarked Max Gradel slammed a volley home in the 18th minute. 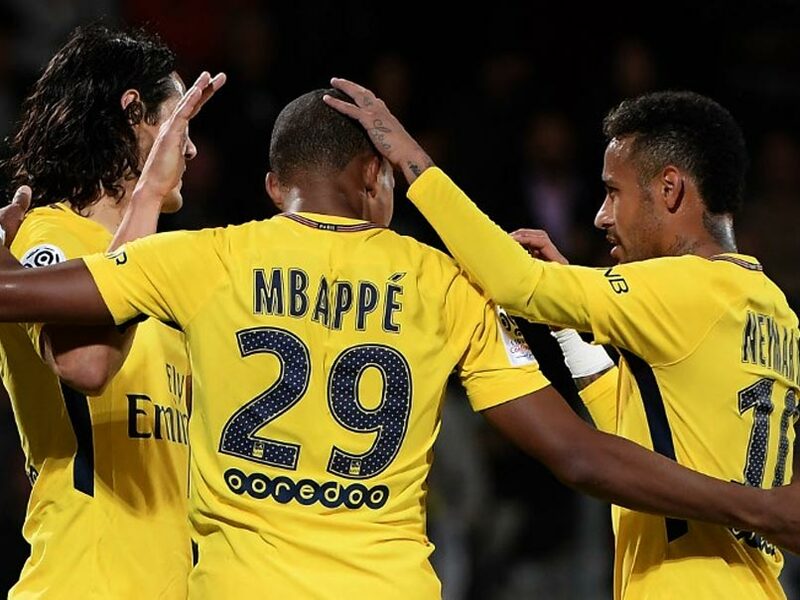 After twice being denied by the woodwork, Neymar, who scored on his debut in the 3-0 win at Guingamp last week, equalised with a poacher’s finish before setting up Adrien Rabiot to give PSG the lead in the 35th minute. Unai Emery’s side stepped off the gas in the second half and lost Verratti to a second bookable offence with 21 minutes remaining, but, after Neymar was fouled by Andy Delort in the box, Edinson Cavani drilled home a penalty. Thiago Silva headed into his own net to set up a tense finale, but substitute Javier Pastore’s stunner was outdone by an acrobatic effort from Kurzawa. Neymar then capped the victory with a lovely individual finish as PSG maintained their 100 per cent record to join Monaco and Saint-Etienne at the summit. Blaise Matuidi made his debut for Juventus on Saturday following his €20million switch to Turin and returned to Paris for an official send off, but on the pitch PSG quickly focused on the task at hand and Neymar grazed the top of the crossbar from 12 yards in the 14th minute. However, PSG found themselves behind when Gradel met Kelvin Amian’s right-wing cross with a powerful volley that flew beneath Alphonse Areola. The woodwork again denied Neymar when the impressive Alban Lafont tipped his header behind via the post, but the Brazilian reacted first after the Toulouse goalkeeper kept out Rabiot to slot home from six yards. Neymar then set up Rabiot, who drilled a fine finish into the bottom-right corner from just outside the box to complete the turnaround. PSG were unable to open the visitors as freely after the restart and their task was made harder when Verratti, booked for going through the back of Alexis Blin in the opening period, caught Christopher Jullien late and was shown a second yellow card by referee Amaury Delerue. Still, the hosts extended their advantage when Cavani thumped home a penalty awarded after Delort sent Neymar to ground with 15 minutes remaining. The stage was set for a tense finish when Silva inadvertently headed a corner past Areola 12 minutes from time, but any nerves did not last long. Pastore replaced Thiago Motta prior to Verratti’s dismissal and he curled a sublime shot into the top-right corner to restore PSG’s two-goal cushion. It got even better for the hosts less than two minutes later when Neymar’s arrowed corner was smashed beyond Lafont by a majestic volley from Kurzawa. Neymar finished the job himself, getting away from Jullien and spinning clear of Issa Diop before beating Lafont low to the goalkeeper’s left, ending a remarkable night in Paris in fitting fashion.